Our mission is to offer the best accommodation possible, keeping a warm, cozy "guesthouse" feeling. This is why all our rooms have been designed with every comfort. Every room provides a media centre with 24hr free internet access, should it be business or leisure, feel free to access the net anytime you like! Wi-fi connections and wireless keyboards and mouse are available for you to check your mail from any corner of the room or can be used with your own laptops! And if you want to listen to your own music, just connect your own mp3 to the hi-fi station! In every room there is also a Colour Tv Lcd 32 inches that you can use to see your own movies, watch your camera videos taken during the day or just any movie rented at the videostore located next door. Moreover, each rooom has got air conditioned, jacuzzi (bath or shower), cooking facilities with frigobar. New deluxe room have also a private roof garden!! And if you want to listen to your own music, just connect your own mp3 to the hi-fi station! The only trouble might be you will not leave anymore!! 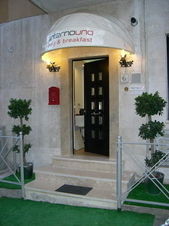 Thanks to the success of our stutture we have opened a new guesthouse in the heart of Rome. The services of InternoUno two steps from the colosseum! Every room is equipped with private PC with free internet connection, free wifi in all room, a large TV LCD 32', air conditioned and JACUZZI!!! You can cook your breakfast or every meal in your private cooking corner, equipped with all you need for cook. A beautiful saving, no? InternoUno is in central zone, few steps from Tiburtina station, new major train station in Rome. In few minutes you can go everywhere in Rome with metro. 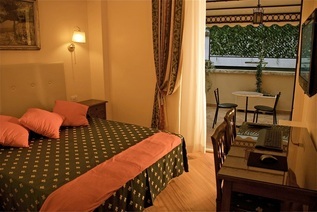 At InternoUno you get a fantastic hotel style room athostel prices. That’s it! If you can afford not having a 24hr reception or a restaurant in the hostel, then InternoUnol it’s your ideal base for an amazing Roman holiday!